The Dreyfus Case, notorious for its betrayals and anti-Semitism, inspires this new thriller from the author of Fatherland. Harris’s novels, a number of which have been successfully filmed, have exhibited an unusual variety of subjects and periods. I’ve enjoyed a good many of them and was excited to learn that his latest dealt with l’affaire Dreyfus, a matter I’ve been interested in since I first encountered it as a history student more than 50 years ago. The opening to the book is suitably cinematic. Major Georges Picquart, marginally involved in the action against Alfred Dreyfus who has been convicted of treason, gives an account of Dreyfus’s humiliating public decommissioning, which involves being stripped of all insignia and braid from his uniform and the breaking of his sword. He looks … like a Jewish tailor counting the cost of all that gold braid going to waste. If he had a tape measure around his neck he might be in a cutting room on the rue Auber. 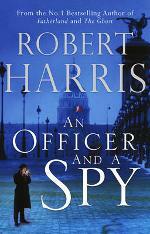 The first technical problem Harris has to deal with is to give a French flavour to writing in English. He adopts the bold approach of sprinkling descriptions and dialogue with French words and phrases and it works. Throughout my reading I felt I was in the presence of French people speaking French, eating French food, wearing French clothes and following French customs. The book concerns Picquart’s discovery, after he has been promoted to colonel and head of the secret intelligence service, that Dreyfus has been framed and that senior members of the army and government have invested so much in Dreyfus’s conviction, in an atmosphere of virulent anti-Semitism, that they cannot allow it to be challenged. Picquart’s conversion (he has been, if not anti-Semitic, certainly not pro), to the Dreyfus cause is a bombshell. It is as if the head of ASIO had found that the Petrovs were not spies and had to defend them against Menzies and the entire political and intelligence establishment. From this point on Picquart is in danger. He has an alternative traitor, one Esterhazy who has a shady past, a gambling habit and a mistress – a former prostitute with the eye-catching name of Four-fingered Marguerite. A tiny slim woman in a white fur hat and muff and carrying a frilly blue umbrella, and being escorted by a tall lieutenant of the dragoons was recognised by some of the spectators nearest the railings and a light patter of applause, punctuated by ‘Hurrah’ and ‘Bravo’ drifted over the mud. There is a good deal of intelligence gathering and sifting, surveillance, forgery and debate about the validity of ‘product’ (I am willing to accept that there is a French equivalent of the word) all handled with a deft touch reminiscent of le Carré. There is solid historical context; France in the late 1890s is still suffering spiritually from its loss to Germany three decades earlier. And there is action – several murders, or were they suicides? And a duel. A scene shift to North Africa where Picquart is posted, to be spied upon, possibly to be killed, is particularly effective as a narrative break. I think of Dreyfus and try to imagine what he is doing, whether they still manacle him to his bed at night Our destinies are entirely intertwined. I depend on his survival as much as he depends on mine – if he endures then so will I.
Interestingly, Dreyfus himself is not a particularly appealing character. Brave certainly, but stiff-necked and somewhat unimaginative. Army to the hilt. These characterisations add a stiffening, a useful element of non-heroic reality, to the playing out of their respective stories. An Officer and a Spy reminds us of why we value historical novels – they take us back to times, characters and places we will never know. They increase our knowledge and enrich our imaginations.